The Watkins Glen State Park can be found in the state of New York, in the Finger Lakes region. The lower part of the park lies close to the town of Watkins Glen, and the upper portion of the park lay in a wooded area. It is approximately 1000 acres of beauty, leaving visitors surprised and stunned at the fairytale-like setting that they find. A narrow but deep gorge (400 feet deep) is the highlight of the park, as it cuts through the massive rocks on either side, making way for the delicate stream that is known as Glen Creek. 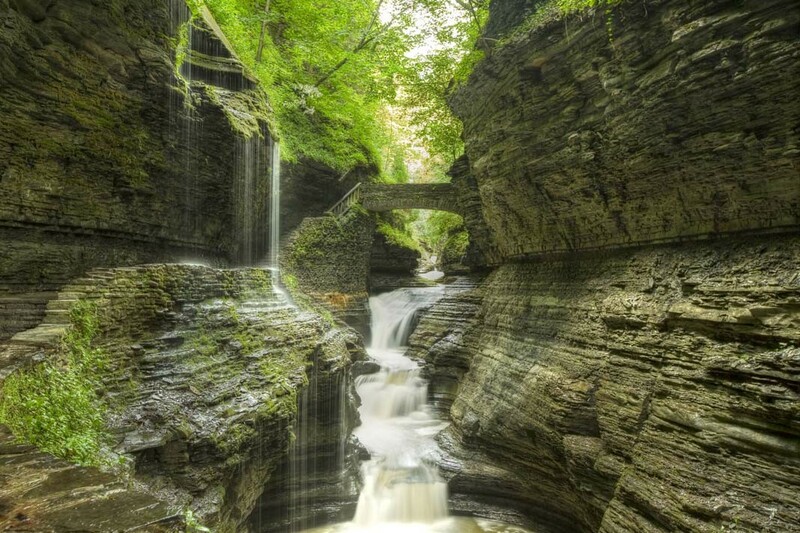 There are a multitude of waterfalls, mossy areas, bridges, and amazing sights to experience at the Watkins Glen state park. Located in the central part of the state of New York, the Finger Lakes region has waterfalls, beautiful lakes, and pastoral land that make up the region. Ancient glaciers once carved their way through the land, leaving behind the remnants of their paths. The eleven Finger Lakes is now filled with water after the glaciers disappeared. 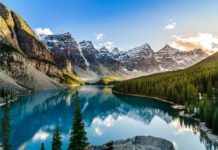 The flow of water down the hillsides to fill the gorgeous, stream and lakes is ever present and flowing, creating beautiful scenery that leaves a lasting impression and appreciation for the beauty of nature. Camping is inexpensive and an excellent way to explore the area. The Watkins Glen Park has 305 campsites with restrooms to choose from and stay at. There are also ten cabins without water and electricity available for those who like to camp in a tent or cabin. Just stumble out the door and go for a hike to see one of the 19 waterfalls and the beauty of the Finger Lakes area. Take a swim in the Olympic sized swimming pool for fun with the kids or for some time to relax after a great hike. There is also a kiddie pool for the smaller kids on site. The campgrounds have showers with hot water, dumping stations and there is firewood for sale. Food concessions are offered, and there are plenty of picnic tables and grills to use. A modern playground, gift shops, a rental pavilion and playing fields are all available to you. Don’t forget to enjoy the gorgeous trails the park is so famous for and take in the lovely scenic views. If you camp for an extended stay, there are plenty of stuff to do within 10 miles of the area. Water activities and rentals such as boat rentals, canoe rentals, canoeing, fishing, paddle boating, sail boating and swimming on a beach are all within proximity to Watkins Glen. There are also antique shops, cultural activities, and restaurants, shopping and golfing for some fun during your stay. 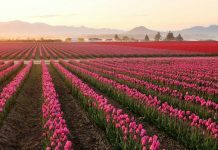 With so many things to do and see, you could make this an extended trip to have fun and enjoy the region and what it has to offer. 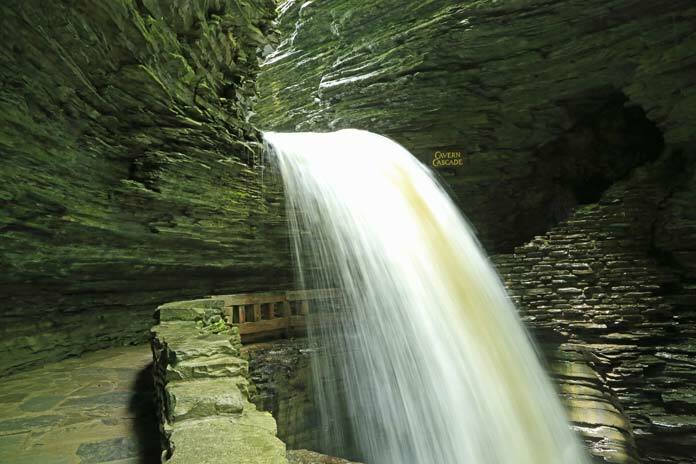 The Watkins Glen state park has many trails, but there are three main paths that you need to experience during your visit to the Finger Lakes area. The first trail is the Indian Trail which takes you to the upper entrance and through the woods. You can see the Lovers Lane area that branches off the Indian Trail, or you can connect to the Gorge Trail from there as well, to see more of the park on a lengthier hike. 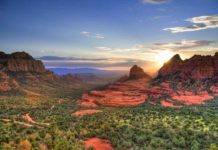 The Southern Rim Trail takes you closer to the waterfalls and overlooks the gorge that is so famous. The Southern Rim Trail is the opposite of the Indian Trail, with its location far south, while the Indian trail is furthest to the north. The Gorge Trail is the most popular and scenic trail and lies between the other two hiking trails. As you wind through this wonderful trail, you will walk under and over waterfalls, and up and down hundreds of stone steps throughout the hike. Stop on the Rainbow Bridge to see the falls and experience the fairytale-like setting of this magical place. 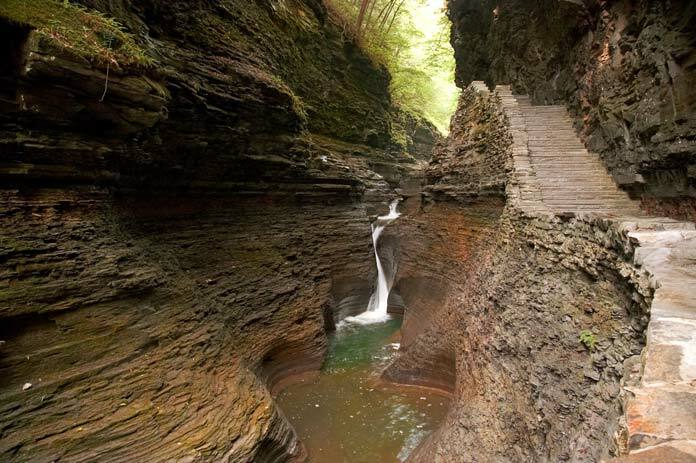 The Watkins Glen state park is open year-round. 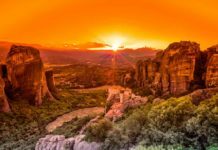 However, New York winters can be cold, icy, and snowy, so the best time to experience the magic of this park is in late spring, summer and in the early fall months before the weather turns cold. The trails are opened based on weather conditions. If storms arise, or severe weather strikes, they will be closed. You can call 607-535-4511 to check the trail status before your trip or your arrival. The swimming season is from June 20th to September 7th. There is a trail shuttle that can transport you to and from the trails, and it runs seven days a week during the summer, and then weekends only after the Labor Day holiday. 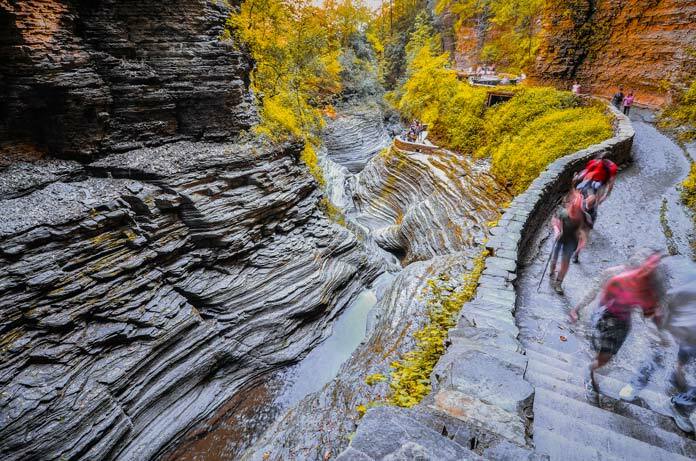 Watkins Glen state park was voted one of the top state parks in the entire United States. It has great amenities on site and many things to do and see within 10 miles of the campground. Swimming, hiking, boating, camping and having the time of your life can all be done at this beautiful state park. Hike the famous trails that are open from mid-May through early November and be sure to try the Gorge Trail. The trails in the park connect to the Finger Lakes Trail which has over 700 miles of a trail system throughout the state. Experience what it’s like to see real life in a fairytale setting, right here at Watkins Glen Park.